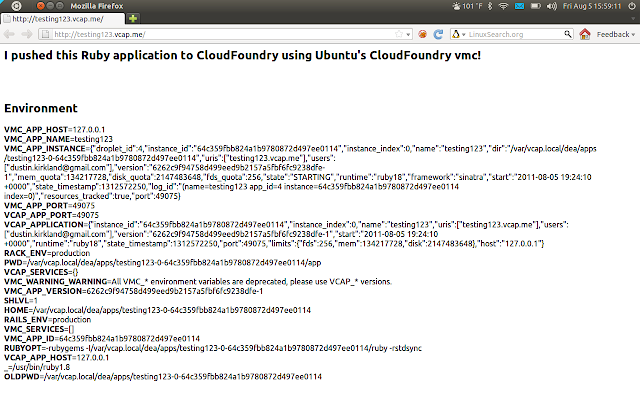 I recently gave an introduction to the CloudFoundry Client application (vmc), which is already in Ubuntu 11.10's Universe archive. Here, I'd like to introduce the far more interesting server piece -- how to run the CloudFoundry Server, on top of Ubuntu 11.10! As far as I'm aware, this is the most complete PaaS solution we've made available on top of Ubuntu Servers, to date. A big thanks to the VMWare CloudFoundry Team who has been helping us along with the deployment instructions. 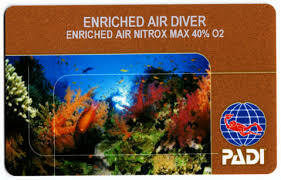 Also, all of the packaging credit goes straight to Brian Thomason, Juan Negron, and Marc Cluet. For testing purposes, I'm going to run this in Amazon's EC2 Cloud. I'll need a somewhat larger instance to handle all the services and dependencies (ie, Java) required by the platform. I find an m1.large seems to work pretty well, for $0.34/hour. I'm using the Oneiric (Ubuntu 11.10) AMI's listed at http://uec-images.ubuntu.com/oneiric/current/. All in all, the install took me less than 7 minutes! Now, you'll need to target your vmc client against your installed server, rather than CloudFoundry.com, as I demonstrated in my last post. In production, you're going to need access to a wildcard based DNS server, either your own, or a DynDNS service. If you have a DynDNS.com standard account ($30/year), CloudFoundry actually supports dynamically adding DNS entries for your applications. We've added debconf hooks in the cloudfoundry-server Ubuntu packaging to set this up for you. So if you have a paid DynDNS account, just sudo dpkg-reconfigure cloudfoundry-server. For this example, though, we're going to take the poor man's approach, and just edit our /etc/hosts file, BOTH locally on our laptop and on our CloudFoundry server. First, look up your server's external IP address. If you're running Byobu in EC2, it'll be the lower right corner. Otherwise, grab your IPv4 address from the metadata service. At this point, you can jump over to my last post in the vmc client tool for a more comprehensive set of examples. I'll just give one very simple one here, the Ruby/Sinatra helloworld + environment example. Go to the examples directory, find an example, and push! And there you have it! 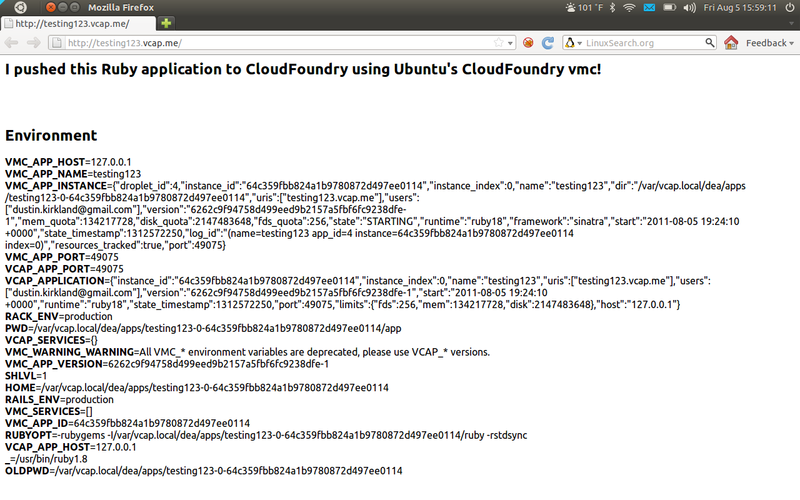 An application pushed, and running on your CloudFoundry Server -- Ubuntu's first packaged PaaS! So the above setup is a package-based, all-in-one PaaS. That's perhaps useful for your first CloudFoundry Server, and your initial experimentation. But a production PaaS will probably involve multiple, decoupled servers, with clustered databases, highly available storage, and enterprise grade networking. The Team is hard at work breaking CloudFoundry down to its fundamental components and creating a set of Ensemble formulas for deploying CloudFoundry itself as a scalable service. Look for more news on that front very soon! In the meantime, try the packages at ppa:cloudfoundry/ppa (or even the daily builds at ppa:cloudfoundry/daily) and let us know what you think! Are these packages suitable for lucid? We'd really like to use this but we prefer LTS releases. 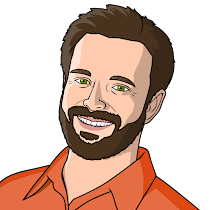 update-alternatives: using /usr/lib/jvm/java-6-openjdk/jre/bin/javaws to provide /usr/bin/javaws (javaws) in auto mode. If I rerun apt-get install it finishes this time. I configured the "public ip" to be 127.0.0.1 and not to use a custom domain. I am also getting similar error. Is there a way to check from the processes on ubuntu if the server is running? Or how to restart the server? Excuse me I'm completely new to this concept, and I need someone to please explain the following to me. I get the following. Can someone explain to me why? Do I have to rout a port to my machine, and include that IP with a port number instad?? Can the packages be updated to the latest and greatest VCAP thats in GIT? These packages are too old. And installing via the GIT setup scripts takes forever as it re-compiles lots of apps.